Banking systems are inherently distributed in multiple branch and ATM locations, as well as home banking over the internet. As the number of access points grows, so does the complexity of IT systems management. Systems need to be readily available and productive yet secure and protected from data-breach. The risks of irregular maintenance and non-compliance of IT and security policies can cost the organization much in terms of fines, lost opportunities and a damaged reputation. 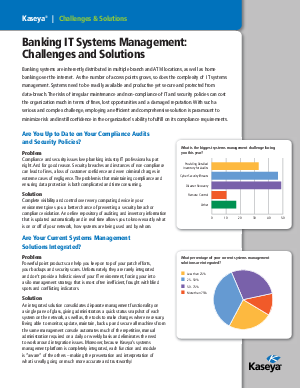 With such a serious and complex challenge, employing an efficient and comprehensive solution is paramount to minimize risk and instill confidence in the organization’s ability to fulfill on its compliance requirements.